Windows 7 Command Bar Tweaker is a free portable tool that allows you to auto hide or permanently hide the command bar in Windows 7 & Vista. Run the tool and select Auto Hide Command Bar to hide the command bar when your mouse is away from the command bar area or Permanently Hide Command Bar to hide it permanently. 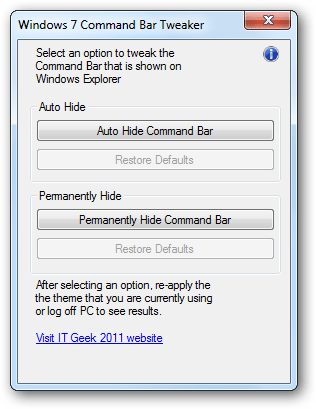 If you want to unhide the command bar, click Restore Defaults. It only works with the default Aero theme.